Apple iPad comes with a thin, lightweight and sleek design which provide this tablet a stylish look. Thanks to its slim design, this tablet grants an intuitive experience and feels great in your hands. The multi-touch subsystem has been re-engineered, widening the ways you can interact with ipad. It weighs only 437 grams and have the dimensions of 9.4 X 6.6 X 0.24 in. 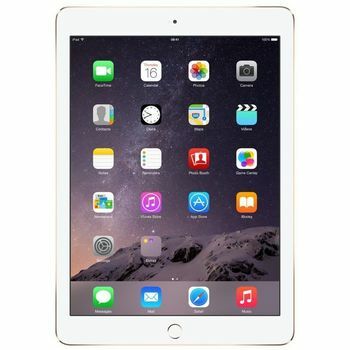 Ipad Air 2 Wifi comes with high resolution 9.7 Inch (diagonal) LED-backlit Multi-Touch display with IPS technology having resolution of 2048-by-1536-pixel at 264 ppi pixel density. IPS technology provides you the wide angle of viewing with ultimate picture clarity irrespective of the angle. The display also features fingerprint-resistant oleophobic coating, fully laminated screen, and antireflective coating. It is easier, faster and more engaging. The tablet is powered by A8X chip with 64?bit architecture, M8 motion coprocessor and is supported by 2GB RAM which conveys an extraordinary performance while being extremely efficient. The M8 motion coprocessor further enhances the performance of the tablet that continuously measures data from the accelerometer, gyroscope, compass and barometer. It consists internal memory of 32GB that is sufficient to store all your data, multimedia files without any difficulty. The ipad offers you 8 MP primary camera with auto focus, panorama (up to 43MP), auto HDR, and exposure control that lets you take vibrant and sharp photographs even in dim lightning condition. Having 1.2 MP secondary camera, the main camera also features burst mode, tap to focus, timer mode, f/2.4 aperture, five-element lens, hybrid IR ?lter, backside illumination, auto image stabilization, face detection, and photo geotagging that enables you shoot beautiful images and videos. Slim Design Apple iPad comes with a thin, lightweight and sleek design which provide this tablet a stylish look. Thanks to its slim design, this tablet grants an intuitive experience and feels great in your hands. The multi-touch subsystem has been re-engineered, widening the ways you can interact with ipad. It weighs only 437 grams and have the dimensions of 9.4 X 6.6 X 0.24 in. Enchanting Display Ipad Air 2 Wifi comes with high resolution 9.7 Inch (diagonal) LED-backlit Multi-Touch display with IPS technology having resolution of 2048-by-1536-pixel at 264 ppi pixel density. IPS technology provides you the wide angle of viewing with ultimate picture clarity irrespective of the angle. The display also features fingerprint-resistant oleophobic coating, fully laminated screen, and antireflective coating. It is easier, faster and more engaging. The Power to do it All The tablet is powered by A8X chip with 64?bit architecture, M8 motion coprocessor and is supported by 2GB RAM which conveys an extraordinary performance while being extremely efficient. The M8 motion coprocessor further enhances the performance of the tablet that continuously measures data from the accelerometer, gyroscope, compass and barometer. It consists internal memory of 32GB that is sufficient to store all your data, multimedia files without any difficulty. 8 MP Primary and 1.2 MP Secondary Camera The ipad offers you 8 MP primary camera with auto focus, panorama (up to 43MP), auto HDR, and exposure control that lets you take vibrant and sharp photographs even in dim lightning condition. Having 1.2 MP secondary camera, the main camera also features burst mode, tap to focus, timer mode, f/2.4 aperture, five-element lens, hybrid IR ?lter, backside illumination, auto image stabilization, face detection, and photo geotagging that enables you shoot beautiful images and videos.